To my knowledge, at no time did the structures of the Church in western and central Europe bar the use of the vernacular in private devotion or in private writing. Indeed, for the illiterate, such prayers are the only way they could pray. For the literate, there were times when their mother tongue would take over, as when Stephen Harding (I think he’s the one; or Aelred?) died with the English name ‘Crist’ on his lips. Anyway, the Latin Middle Ages contain a great quantity of vernacular religious literature, and there is, frankly, not enough time for me to go into all of it here. A few highlights are worth discussing, though, I’d think. First things first, then. You should go check out Eleanor Parker’s blog A Clerk of Oxford, an excellent blog exploring many facets of Old English life, religion, and literature. A lot of it is devoted to religious literature, both its translation into modern English as well as its explication for the 21st-century reader. If, for some reason, you’re still reading my poor excuse of a blog, I’ll start by saying that Anglo-Saxon Christian literature is very much worth your time. There is some splendid religious poetry to be found that will stir your heart up unto the Lord. Which is the whole point. A pleasant anthology, both from Old English and Latin, is Benedicta Ward’s Christ Within Me. Vernacular Christian literature did not suddenly vanish in 1066 with the Norman Conquest. I’ve featured here the Middle English poem ‘Man and Woman Look on Me!’, a moving piece in the persona of Our Lord from the Cross. I find there is a lot of powerful devotional poetry in Middle English. Of course, Middle English religious literature cannot pass by without discussing Julian of Norwich (d. 1416), one of the most famous mystics of the era (at least in English-speaking countries), whom I even feature here a little bit. Her Showings are worth a read or two. Julian is not the only vernacular English mystical writer from the Middle Ages, though. Also of great popularity from the second half of the 1300s is The Cloud of Unknowing, a discussion of how to focus the mind and heart on God, a guide to contemplation (I’ve not read it, alas). Third (and also waiting to be read by me) is Richard Rolle (1300-1349), another English medieval mystical writer in the vernacular. Another Middle English mystic I have yet to read is Walter Hilton (d. 1396), whose Scale of Perfection was recommended to me by Lisa Deam who now blogs over at The Contemplative Writer. English is not the only vernacular literature of the Latin Middle Ages. 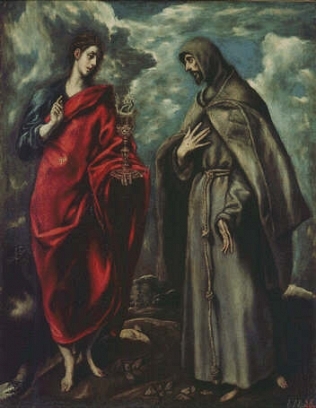 Italy produced for us St Francis of Assisi (d. 1226) , one of the first poets to write in the Italian language. Besides his Canticle of the Sun, I highly recommend the next generation’s Fioretti, or ‘Little Flowers’, which are inspirational tales about the original Franciscans. Another important writer in Italian is St Catherine of Siena, herself a Dominican (d. 1347); her Dialogue is very challenging and thought-provoking. There is so much more to cover — the continental Old Saxon Heliand, a ninth-century epic retelling of Christ; Lilja, an Icelandic poem of the fifteenth century; Dante (!! ); medieval Irish saints’ lives and poetry; and so much more. If we lean forward just a bit, we can peek into the world of sixteenth-century Carmelites writing in Spanish as well — St Teresa of Ávila and St John of the Cross. One thought that occurs as I glance over these authors. Most of them are members of religious orders or, in the case of Julian of Norwich and Richard Rolle, hermits/anchorites. But consider which religious orders — Walter Hilton was an Augustinian; Francis founded the Franciscans; St Catherine was a Dominican. These are the orders that interact with ordinary people, rather than the orders of the cloister (the Benedictines, Cistercians, etc). I am greatly fond of monastic spirituality, but perhaps something important is to be found in this 13th- and 14th-century vernacular mendicant literature that will not be found in the majestic twelfth-century monastic literature. They also, whether monastic or mendicant, exist in the world of the cities and the growing merchant class — not all of whom may have known Latin but who could probably read their own language to some degree. Another thought worth pondering. Be that as it may, the Latin Middle Ages had their share of vernacular religion for the ordinary people. It wasn’t just priests for priests or monks for monks. There was vernacular preaching, there were even vernacular Bibles, and there were vernacular treatises, poems, saints’ lives, and even plays. The medieval west is, perhaps, more varied than our post-Reformation visions give it credit, then.